Revving up for her debut album release, Diamante has released Volume II, a collection of songs from her forthcoming album, Coming In Hot, out June 15 on Better Noise Records, featuring the viral title track and four previously unreleased tracks: "Black Heart", "I'm Sorry", "Kind of Love" and a cover of HEART's "Crazy On You". Produced and mixed by Howard Benson [Chris Cornell, Kelly Clarkson, MY CHEMICAL ROMANCE, HALESTORM], the songs brings to light a signature sound the artist has been developing meticulously since age 13. With sultry vocals, pop sensibility, and unabashed rock swagger, the multicultural solo artist draws from myriad influences and calls to mind legends from a spectrum of rock icons including Joan Jett, Pat Benatar, Debbie Harry, MOTLEY CRUE, DEF LEPPARD, and Bowie. 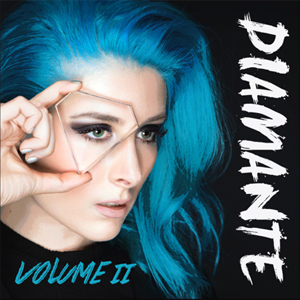 Additionally, Diamante has teamed up with BAD WOLVES as a guest vocalist on their latest single "Hear Me Now". The official music video has garnered over 2.5 million views since its release and peaked at #3 on the iTunes Rock Charts. She is currently appearing with BAD WOLVES each night to perform the track on their tour with SHINEDOWN and FIVE FINGER DEATH PUNCH. 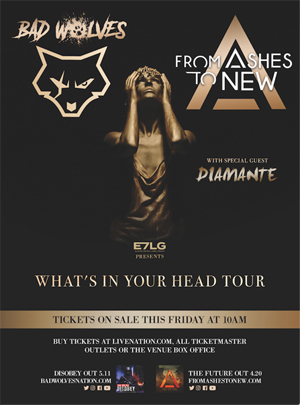 Diamante will be on the road supporting labelmates BAD WOLVES and FROM ASHES TO NEW on this summer on the "What's In Your Head?" Tour. All tour dates listed below.